The Gaza War, also known as Operation Cast Lead (מִבְצָע עוֹפֶרֶת יְצוּקָה‎), was a 22-day armed conflict between Palestinians in the Gaza Strip and Israel that began on December 27, 2008, and ended on January 18, 2009. Israel’s stated goal was to stop indiscriminate Palestinian rocket fire into Israel and weapons smuggling into the Gaza Strip. Hamas seized power from the Palestinian Authority (PA) in what amounted to a coup in June 2007. This allowed them to confiscate armored vehicles and weapons given to the PA by Israel, the United States and other countries. In addition, the group manufactured its own mortars and rockets while smuggling in from Egypt more sophisticated rockets provided by Iran. Between 2005 and 2007, Palestinian terrorist groups in Gaza fired about 2,000 rockets into Israel, killing four Israeli civilians and injuring 75 others. The bombardment continued in the first half of 2008. On June 19, 2008, Egypt brokered a six-month pause in hostilities that required Hamas to end rocket and mortar attacks on Israel. Hamas was also expected to halt its military buildup in Gaza and release an Israeli soldier, Corporal Gilad Shalit, it was holding hostage. In exchange, Israel agreed to ease the blockade of Gaza and to halt military raids into Gaza. As part of the deal Egypt promised to stop the smuggling of arms and weapons from its territory into Gaza. Meanwhile, Hamas prepared for urban warfare with the goal of maximizing Israeli casualties if the IDF entered Gaza. Terrorists booby-trapped houses and buildings and built an extensive system of tunnels in preparation for combat. 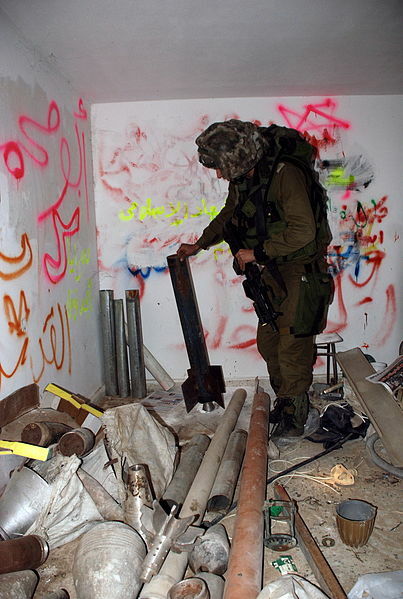 Many Hamas members dug tunnels under their homes and hid weapon caches in them. Arsenals were also hidden in mosques. Throughout the fall, Israel and Hamas accused each other of violating the Egyptian-mediated truce. Rocket fire from Gaza never stopped entirely and weapons smuggling continued. Hamas insisted Israel never allowed the expected amount of goods to flow into Gaza and of conducting raids that killed Hamas fighters. Despite discussions by both sides aimed at extending the cease-fire, violence continued. On December 24, an Israeli airstrike targeted terrorists who had fired mortars at Israel. Hamas subsequently fired a barrage of rockets and mortars into Israel and warned it would put thousands of Israelis “under fire.” For images of the rocket attacks please see Hamas Rocket Attacks on Israel. The next day, Prime Minister Ehud Olmert warned Hamas to stop attacking Israel, but the terrorists responded with another salvo of rockets. At 11:30 a.m. on December 27, 2008, Israel launched Operation Cast Lead. It began with a wave of airstrikes in which F-16 fighter jets and AH-64 Apache attack helicopters simultaneously struck 100 targets within a span of 220 seconds. Thirty minutes later, a second wave of 64 jets and helicopters struck an additional 60 targets. The air strikes hit Hamas headquarters, government offices and 24 police stations. Israeli Air and Naval Forces struck Hamas terrorist cell headquarters throughout the Gaza Strip including a Hamas training base and outposts as well as Hamas government complexes. They also attacked rocket launchers and Grad missile stockpiles. Houses of senior Hamas and Jihad terrorists were targeted along with dozens of tunnels that have been used to pass weaponry into Gaza. Hamas was caught by surprise. The Israeli government had leaked information to the Israeli press suggesting an attack was not imminent. Many Hamas terrorists had come out of hiding; consequently, approximately 140 members of the group were killed the first day, including Tawfik Jaber, head of Hamas’ police force. The Israeli attack was the deadliest one-day death toll in 60 years of conflict between the Israelis and Palestinians, a day that was called the “Massacre of Black Saturday” by Palestinians in Gaza. Hamas responded with a rocket barrage on southern Israel. Defense Minister Ehud Barak said the operation had three objectives: dealing Hamas a forceful blow, fundamentally changing the situation in Gaza, and bringing the rocket attacks against Israeli citizens to a complete halt. Meanwhile, despite the frantic pleas of the Palestinians, Egypt refused to fully open its border with Gaza. President Hosni Mubarak also rejected demands from the Arab world that he assist Hamas. Egypt’s Foreign Minister, Ahmed Aboul Gheit, argued that terrorist groups such as Hamas and Hezbollah were only interested in creating unrest and doing harm in the world. He said he would not allow Egypt’s “honorable forces” to take part in the group's actions. potential targets. In a practice referred to as “roof knocking,” the IDF issued warning calls before air strikes on civilian buildings. Typically, residents of a building on the target list would be informed they had 10–15 minutes to leave the area. The IAF also developed a sound bomb designed to frighten residents and prompt them to flee before explosive bombs were dropped. If civilians were detected near targets, IDF commanders called off airstrikes and pilots aborted their missions. At least one Palestinian witness told an Italian reporter there were rocket-launchers or Hamas look-outs on many roofs of the tall buildings that were hit by Israeli bombs, including a UN building. Terrorists captured by Israel also admitted Hamas stored weapons in tunnels, in the homes of activists, and in citrus groves and mosques. One army video taken by a drone during the war showed a Hamas terrorist launching a rocket from the roof of a residential house and then leaving surrounded by children to avoid being targeted by the IDF. Other Israeli Air Force videos revealed terrorists using groups of children as cover to escape from combat areas. Hamas also used doctors, nurses and patients in hospitals for cover. The basement of the Shifa Hospital complex in Gaza City served as the Hamas headquarters and, while journalists were allowed to report on casualties brought into the facility, they rarely mentioned, and never photographed the Hamas leaders using it as a shelter. Israel later discovered a tunnel underneath a mosque located alongside the hospital connected to the maternity ward, which was used by Hamas operatives to move undetected. Hamas also set up command centers inside a children’s hospital located in the Nasser neighborhood and in a Red Crescent Society clinic in Khan Yunis. A training base and military camp was set up next to the Al-Fahoura Medical Center and Hamas launched rockets in close proximity of the center. Altogether, Hamas used at least 10 Gazan hospitals for launching rockets at Israeli towns and for attacking IDF troops. After sustaining three years of rocket bombardment against its civilian population, Israel had finally decided that a military response was necessary to defend its people. The United Nations and the rest of the international community were silent while thousands of rockets rained down on Israelis for years; consequently, Israelis were not moved by the world’s sudden interest in the conflict between Israel and Hamas. Israel criticized the resolution and ignored it, as did Hamas. On the evening of January 3, 2009, Israel began ground operations to control open areas and encircle towns and refugee camps from which terrorists continued to launch rockets. Tens of thousands of army reservists were called up for training. Many reservists who were not called volunteered. Israeli officials decided troops would not enter densely populated areas. Still, it was necessary to send Combat Engineering Corps sappers in to clear IEDs and dismantle boobytraps. Ron Ben-Yishai, an Israeli military correspondent embedded with the ground forces, stated that entire blocks of houses were booby-trapped, and an Israeli commander said that boobytraps were found in a mosque and one-third of the houses. Hamas terrorists sometimes emerged from tunnels to fire at IDF soldiers, then pulled back to lure troops into built-up areas. In one case, a Palestinian dressed in an Israeli Army uniform opened fire on a group of soldiers, but was killed before he could cause any casualties. In several instances, would-be suicide bombers with explosive vests charged Israeli soldiers, but all were killed before they could reach their targets. On January 6, heavy fighting took place between Israeli troops and Palestinian terrorists on the outskirts of the northern district of Gaza City and IDF forces advanced in Khan Yunis in southern Gaza after heavy fighting on the edges of Deir al-Balah in central Gaza. In Jabalya, an Israeli tank fired a shell into an abandoned building as Golani Brigade soldiers were taking cover in it, killing three soldiers and wounding 24. In a separate friendly fire incident, an Israeli officer was killed by a misdirected artillery shell. On January 7, Israel carried out 40 airstrikes overnight. Dozens of other targets were attacked by aircraft and artillery during the day, and the Gaza-Egypt border was bombed after Israeli aircraft dropped leaflets onto Rafah urging the residents to leave. Hamas fired 20 rockets into Southern Israel. During the conflict, more than 800,000 Israelis came within rocket range. Consequently, life in much of southern Israel was paralyzed. The Israeli Home Front Command issued detailed emergency instructions to Israeli citizens for preparing for and dealing with rocket attacks from the Gaza Strip. The instructions included orders to stay within a certain distance of bomb shelters. Many schools and universities in southern Israel closed, with the exception of those with fortified classrooms and bomb shelters. The largest hospital on Israel’s southern coast, Ashkelon’s Barzilai Medical Center, moved its critical treatment facilities into an underground shelter after a rocket landed near its helicopter pad. Most business in Southern Israel stopped and those companies that remained open had high absence rates. The war provoked mixed reactions inside Israel, with the Jewish majority largely supporting it, and the Arab minority mostly opposing it. A poll taken on January 8, 2009, showed that 91% of the Jewish public supported the war, and 4% opposed it, while a separate poll conducted January 4–6, showed a 94% approval of the war among Jews and 85% disapproval among Israeli Arabs. Due to the number of civilian casualties and the deteriorating humanitarian situation, Israel faced significant international pressure for a ceasefire, the establishment of a humanitarian corridor, and the lifting of the blockade. On January 7, Israel opened a corridor to allow the shipment of aid into Gaza. The Israeli army agreed to interrupt fighting for three hours and Hamas agreed not to launch rockets during the pause. Brief ceasefires were repeated in subsequent days but fighting resumed immediately following the pauses. Israel provided 37,159 tons of humanitarian aid on 1,503 trucks. The government provided diesel fuel and gas, grain and other staples. Ambulances donated by the governments of Turkey and Jordan were transferred to Gaza and 68 chronically ill people and their escorts were allowed to travel from Gaza to Israel, the West Bank and Jordan. Some of the aid was diverted by Hamas to its fighters so it never reached the people for whom it was intended. Israel accused Hamas of firing 44 rockets and mortars during the ceasefires between January 8th and the 17th. IDF ground forces were also accused of operating during the ceasefires. Outraged Arabs around the world called on Israel to end its operation in Gaza. Hundreds of pro-Hamas protests throughout the world burned Israeli and American flags. On January 7, French President Nicolas Sarkozy and Egypt’s Hosni Mubarak delivered a ceasefire proposal to Prime Minister Ehud Olmert, which was subsequently supported by the United States. Two days later, the United Nations Security Council unveiled a new resolution calling for an immediate ceasefire between Hamas and Israel. On January 12, President Bush stated in his final press conference that any sustainable ceasefire agreement between Israel and Hamas must include an end to Hamas rocket attacks on Israeli towns. He continued to say that Israel has an absolute right to defend itself from these attacks. Both sides ignored the call for a ceasefire and the IDF started the third stage of the operation with an attack on the suburbs of Gaza City. Israeli forces pushed into the south of the city and reached a key junction to its north. During their advance, Hamas and Islamic Jihad fighters ambushed Israeli troops at several locations, and heavy fighting ensued in which 40 Hamas and Islamic Jihad fighters were killed. Additionally, the IAF reported that Hamas operatives had tried to shoot down an IAF plane with anti-aircraft missiles for the first time since operations in Gaza began. On January 13, the IDF reported that 25 mortars and rockets were fired into Southern Israel. Israeli tanks advanced toward the headquarters of Hamas’ preventive security building. Before dawn, Israeli troops and tanks supported by artillery and helicopters advanced into Tel al-Hawa while Israeli gunboats shelled Hamas targets along the coast. The push into the neighborhood was Israel’s deepest incursion into Gaza City. On January 15, Israeli artillery started an intense bombardment of Gaza City while fighting was still going on in the streets. Troops and tanks advanced deeper into the city following the shelling. Among buildings hit by shellfire was the al-Quds hospital, Gaza’s second-largest, in the Tel al-Hawa neighborhood. Most Hamas fighters who had gone to Iran to train with the Iranian Revolutionary Guard and composed a 100 man “Iranian Unit” were killed during a battle in the Zeytoun neighborhood. The headquarters of the United Nations Relief and Works Agency (UNRWA) was shelled on January 15. There were three people injured and tons of food and fuel destroyed. Prime Minister Ehud Olmert said, “it is absolutely true that we were attacked from that place, but the consequences are very sad, and we apologize for it, I don’t think it should have happened and I’m very sorry.” An Israeli investigation subsequently said that terrorists ran for safety inside the UN compound after firing on Israeli forces from outside. One-year year later, Israel paid $10.5 million in compensation to the United Nations for damages to UN property. On January 16, more than 50 Israeli airstrikes were carried out against terrorists, tunnels, and a mosque suspected of being used as a weapons store. Israeli forces continued their push into Gaza City, while Israeli Navy vessels shelled militant targets in support. Hamas bombarded Israeli with multiple rockets, which wounded eight people including a pregnant woman. The Israeli government considered an additional phase of operations to deliver a “knockout blow” to Hamas. The idea was rejected after military and intelligence assessments concluded destroying Hamas would require weeks of ground incursions into urban areas and refugee camps. Officials argued such an operation was likely to result in heavy casualties on both sides, including civilians, reduce domestic support for the war, and increase international criticism. Egypt again proposed a ceasefire and both sides said they were considering accepting a truce. Iran discouraged Hamas from signing a ceasefire agreement and threatened to stop supplying weaponry and funds if they did. Moussa Abu Marzouk, deputy head of Hamas’s political bureau stated that Hamas would continue its resistance until Israel ended its “occupation.” He demanded that Israel must halt its operation, open all borders and withdraw from the Gaza Strip. Meanwhile, the United States and Israel signed a “Memorandum of Understanding” on January 16 in which the U.S. pledged to help Israel inhibit Hamas’s smuggling of weapons into Gaza by way of Egypt. The countries also agreed that any ceasefire agreement would prevent Hamas from rearming. On January18, Israeli officials announced a unilateral ceasefire and Olmert declared that the military objectives had been met. The Israeli Cabinet approved the initiative with the knowledge that it was signing a one-sided agreement and Olmert stated that any future attack on Israel would be met with force. Olmert also met with representatives of the European Union who pledged to help Israel prevent the rearming of Hamas in Gaza and agreed that daily rocket fire on Israel was unacceptable. Hamas initially vowed to fight on if Israel did not withdraw and lift the blockade and fired a salvo of rockets on January 18. A day later, the group agreed to a week-long ceasefire. On January 21, all Israeli troops withdrew from Gaza. Hamas claimed victory after the fighting, insisting that Israeli forces did not weaken its military strength and that it driven the Israelis from Gaza. Israel said IDF forces significantly degraded its rocket arsenal, destroyed most of its smuggling tunnels and killed hundreds of its fighters. Israeli, Palestinian, UN and human rights organizations tallied different numbers of Palestinian casualties. Israel acknowledged 1,166 deaths, other sources put the number above 1,400 and claimed most were civilians. Some Palestinians were killed by Hamas rockets. On December 26, 2008, for example, a Palestinian rocket struck a house north of Beit Lahiya killing two cousins and wounding another. According to the IDF, 295 of the Palestinians killed were civilians, 709 were terrorists, and 162 could not be identified. Hamas undermined claims by critics of Israel who insisted the victims of the war were mostly innocent civilians when interior minister Fathi Hammad admitted in 2010 that it lost more than six hundred men during the war, nearly the same figure reported by the IDF. One reason it is likely the number of civilian casualties was inflated by the non-Israeli sources is that many of the terrorists were wearing civilian clothes and arrived at hospitals without weapons or any other evidence they were fighters. Some terrorists also forced the Red Crescent to hand over uniforms of medics and nurses which were used as disguises and allowed them to use ambulances to transport fighters and weapons. In addition to the human toll in Gaza, it was estimated that 14,000 homes, 68 government buildings, 31 non-governmental organization offices and 15 hospitals were either totally or partially damaged. In addition, the war caused extensive damage to water sources, greenhouses, and farmland. An estimated 50,800 Gazans were left homeless. On the Israeli side, Israel suffered 13 dead: 10 soldiers, four of them by “friendly fire,” and three civilians by Hamas rockets. Terrorists fired more than 571 rockets and 205 mortar shells from Gaza into Israel during the conflict. Rockets reached major Israeli cities Ashdod, Beersheba and Gedera for the first time, putting one-eighth of Israel’s population in rocket range. More than 1,500 homes and buildings were damaged or destroyed along with 327 vehicles. Numerous agricultural fields near Gaza also sustained damage. Twenty-Eight Israeli families lost their homes to rocket attacks and had to temporarily live in hotels. Among the buildings hit were nine educational facilities and three synagogues. Journalists often repeated unverified and inaccurate information in their haste to be the first to report a story. 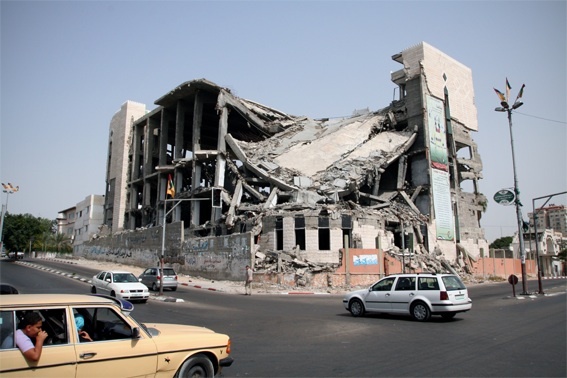 One of the first examples of this in the Gaza War occurred after Israeli forces fired near a UN-run school on January 6, 2009. The press immediately reported that more than forty Palestinians seeking shelter in the building were killed, and the attack was portrayed as a deliberate assault on innocent people. Hours later, Israeli investigators reported that they had fired after being attacked by Hamas terrorists launching mortars from the area. Witnesses supported the Israeli account, and the UN later claimed a “clerical error” led them to falsely accuse Israel of shelling the school. Additionally, the original casualty figure was fabricated; the death toll was actually twelve, nine of whom were Hamas combatants. The facts came too late, however, to offset the initial impression created and reinforced by repeated claims by UN officials discounting the Israeli version. France 2, the same television network that broadcast the notoriously inaccurate story about Mohammed al-Dura during the Palestinian War, aired an erroneous report showing dead children allegedly killed in the Gaza fighting. The amateur video of the dead toddlers being laid out on a white sheet was actually shot after they had been killed by the explosion of a Hamas ammunition truck during a parade in Gaza in September 2005. Inside Gaza, press controlled by Hamas is heavy-handed. There are few press freedoms inside Gaza, and Hamas controls who reports from there and where they can go. While pictures of wounded children being brought to hospitals are clearly encouraged, we rarely see images of Hamas fighters or their rockets being fired into Israel. The media often turns conflicts into numbers games, keeping running tallies of casualties. Israel always is accused of disproportionality because fewer Israelis typically die in confrontations. Israelis, however, are under no obligation to take greater casualties for the sake of looking better in the media box score. The Goldstone Commission was created to conduct a fact-finding mission and to investigate whether any violations of international humanitarian law took place during the conflict between Israel and Hamas during Israel’s Operation Cast Lead in Gaza in December 2008/January 2009. The four-person panel, led by Judge Richard Goldstone, based virtually all of its 575-page report on unverified accounts by Palestinians and NGOs. The Commission fixated on Israel’s incursion into Gaza while failing to adequately address the provocation—three years of Hamas rocket bombardment of Israeli towns and villages—that led to the Israeli operation. The Israeli government did not cooperate with the Commission because of its one-sided mandate that presumed Israel was guilty of war crimes from the outset. When interviewing Gazans, the Commission was chaperoned by Hamas officials to ensure members saw and heard only what Hamas approved. Hence, it was not surprising that investigators made little effort to investigate Hamas activities before or during Operation Cast Lead. It was equally unremarkable for the commission to report that it found no evidence that Hamas had fired rockets from civilian homes, that terrorists had hid among the civilian population, fired mortars, anti-tank missiles, and machine guns into Palestinian villages when IDF forces were in proximity, or that they had seized and booby-trapped Palestinian civilian houses to ambush IDF soldiers. In fact, the report refers to Hamas “police” as civilians, absolving them of terrorist rocket attacks against Israeli civilians and their illegal actions in Gaza during the conflict. This directly contradicts the ample photos, video, and reports by journalists that depicted Hamas militants participating in all of these illegal activities. One postwar study rebutting Goldstone’s conclusions found that many Hamas fighters were dressed as civilians; some were seen in videos firing mortars and rocket-propelled grenades at troops. The report also documented the use by Hamas of dozens of mosques as armories, command centers, and launching areas for rockets. 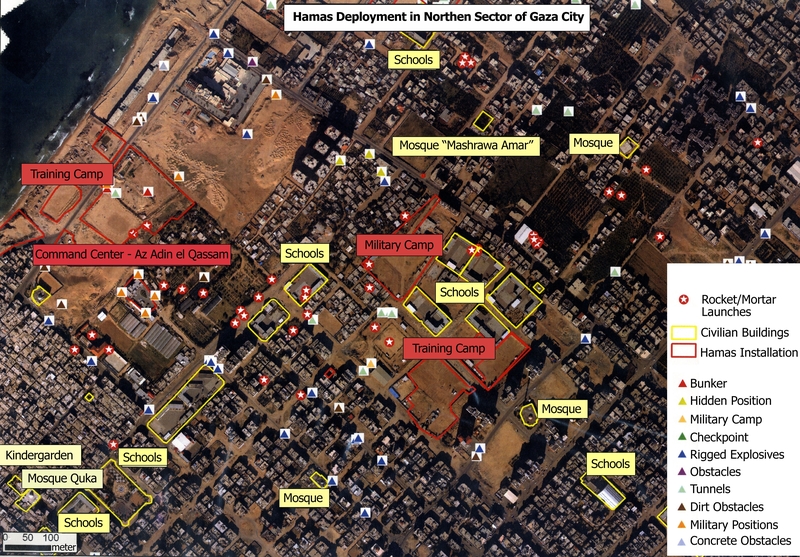 Evidence was also found of Hamas fighters using civilians as shields. Israel’s claims regarding casualties also proved correct, Goldstone concedes. “The Israeli military’s numbers have turned out to be similar to those recently furnished by Hamas.” He is referring to the Hamas admission that, as Israel maintained, most of the Palestinians who were killed in the fighting were terrorists and not bystanders. Goldstone focused his criticism on Hamas in a way the report did not. “That comparatively few Israelis have been killed by the unlawful rocket and mortar attacks from Gaza,” Goldstone wrote, “in no way minimizes their criminality.” He added that Hamas’s actions during the conflict were intentional and “purposefully indiscriminate,” and he excoriated them for failing to investigate any of the war crimes accusations. By contrast, Goldstone acknowledged that Israel has “dedicated significant resources to investigate” allegations of misconduct. Goldstone’s retraction came too late to mitigate the damage caused to Israel by the Goldstone Report as the “evidence” released in the report continues to be used by Israel’s detractors. Israel was pilloried in the press, particularly after the Goldstone report; nevertheless, its policies toward Gaza and the Palestinians were not affected. Israel, in cooperation with Egypt, continues to maintain a blockade. Israel’s position toward Hamas is also supported by the international community, which continues to isolate Hamas (except for Iran and Syria) so long as it rejects the Quartet demands to recognize Israel, accept the Oslo accords and abandon violence. The Palestinian Authority and most Arab leaders were publicly critical of Israel’s actions, but privately happy that Hamas had been weakened and Iran’s proxy defeated. The European Union, the Organization of the Islamic Conference and more than 50 nations donated humanitarian aid to Gaza after the war. The United States donated more than $20 million. According to the U.S. State Department’s 2010 Human Rights Report, the Military Advocate General investigated more than 150 wartime incidents, including those mentioned in the Goldstone Report and had launched 47 criminal investigations into the conduct of IDF personnel. Several soldiers were subsequently found guilty of various offenses. Since the end of the war, Hamas has fired approximately 3,000 rockets into Israel. Only 15 rockets were fired into Israel during 2016, the lowest number in 11 years.